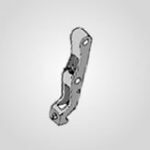 As a leading supplier crane and mill duty brake parts and accessories, Duke Brakes carries a variety of replacement brake parts such as yokes, shoes and magnet coils. Our inventory includes parts that are compatible with brands Clark, General Electric, Westinghouse and many more. Contact us for more information on our part numbers adn services. Duke Brakes will help you find the right parts for your brake model and can even help with the installation and repairs.